Ah yeah and I’ve got a tan! So I am writing to you from bed. Before I fly back to London tonight for my sister’s wedding and then onto Nepal for some mountains, colour and paragliding, I thought I’d update you and possibly myself on what’s happened of late. Its been a very active few months since Sri Lanka. I’m aware I haven’t written about Sri Lanka yet. I don’t know why. I’ll get around to it. When I don’t know. Work here continues to resemble a potential bull in the china shop with the constant joke it may all fall apart. Every week something new appears which previously wasn’t considered a problem. I’ve got over discussing or arguing over it. It’s just the standard modus operandi of the business and the country. It’s a snufu kind of place. Agreements are never confirmed and yet flexibility isn’t an option. There are only confirmed once the big guys who frankly know nothing about it share tea together. Then its all on. Until its not.You just have to go with the now and don’t expect anything better. And yet the knowledge that something previously not an issue will become one gives the place a surrealist tone my sense of humour appreciates. Meetings and agreements cancelled on a whim allow me to go into one of the VIP rooms and use a huge EWB to study. Or watch YouTube or Family Guy. I spend the afternoon studying, downloading, reading or planning my holidays. Initiative is also not expected or encouraged. Revealing yourself to be willing flashes ‘sucker,’ someone to be exploited and it’s only met by curious looks from your fellow workers who believe stepping beyond your role is puzzling. Ask them what their role is and they’ll let their eyes wonder, purse their lips and giggle. Further, confidence is admired so its easy to ‘wing’ it if you have experience. Outside of work, life is flourishing. I’ve got a diverse group of friends. Every Saturday I play football, the first time I’ve played consistently in years. Champions bar is just down the road, often packed and full of screen to watch sport. The complex has a gym here which is pretty empty in the morning. I don’t usually go into work until midday so I’ve got time in the morning. That pool makes me smile. I’ve had time to write much-needed long emails to old friends, caught up on Skype with others and bought and sent gifts around the world. Distance gives you some perspective to review the past and plan the future. And with the internet and my free phone, I can concern myself with others, helping them out if I can and sharing the knowledge grafted from mistakes or long years of travel. Or just simply discussing music or ideas. Communications should be win-win. We’ve been to the beach football, the cycling tour of Qatar, Spain vs Uruguay and the men and women’s singles tennis. 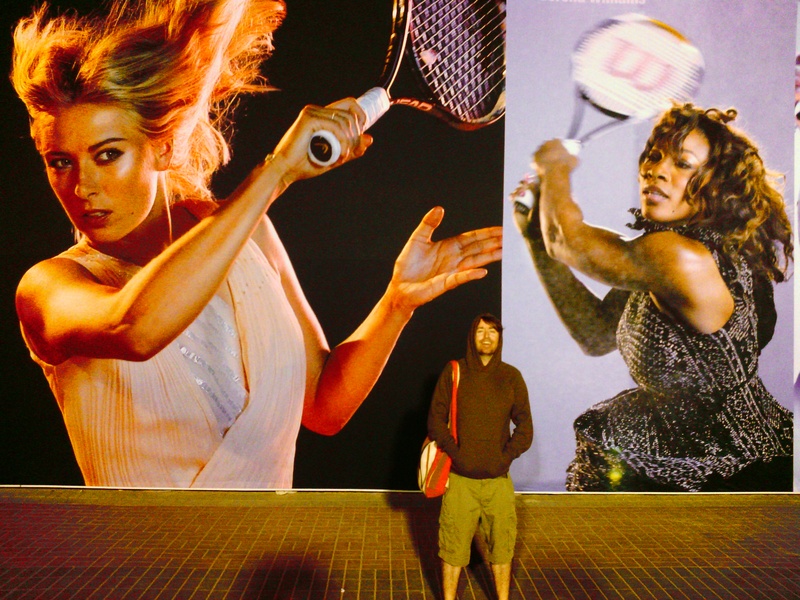 I was on TV at the tennis, giving my usual irreverent response during a Serena Williams match and met Mark Cavendish at the awards ceremony. Last week I was interviewed for the newspaper on writing and blogging about countries making the front page. I’ve been reading about the Middle East, a book Stu lent me. The very recent colonial, Cold War, land and resources issues of this area are reflected in any of its present trials. I’ve finally started my research again. With Dhyan, the Nepalese janitor, we went down to old Doha and interviewed 40 Nepalese men. My friend’s friend had translated the survey into Nepalese language and Dhyan introduced himself to the men and helped them through the survey. His help was invaluable. I took him to a Nepalese restaurant later and we had mou-mou, a dish that reminds me of gyoza, mandu or peirogi. I have the Sri Lankan translation to come from my friend Priyanga and Anne generously translated the Indonesian survey. Next month after this trip, I’ll get onto those. At the same time, I’m doing a MOOC through the University of Amsterdam in Communication Science. That’s where the VIP rooms and big screen TVs come in especially useful! Beyond Nepal, there is the Diamond League athletics, free tickets to Al-Saad, the national football champion’s last game and the British Council festival here. Then there’s the long summer holidays, seeing old friends, music festivals and hopefully the Caucasus Mountains, Iran and some Eastern Europe. There are further complications as per usual but I’ll keep them quiet until they reach more of a boil. For now the rolling hills of England await. I am looking forward to the train ride through those hedged and roughly manicured fields. I’ll meet old friends and later my extended family for sister’s wedding and then a flight to the highest country on Earth. Can’t be bad eh? I went to the WC beach football qualifiers here last week. 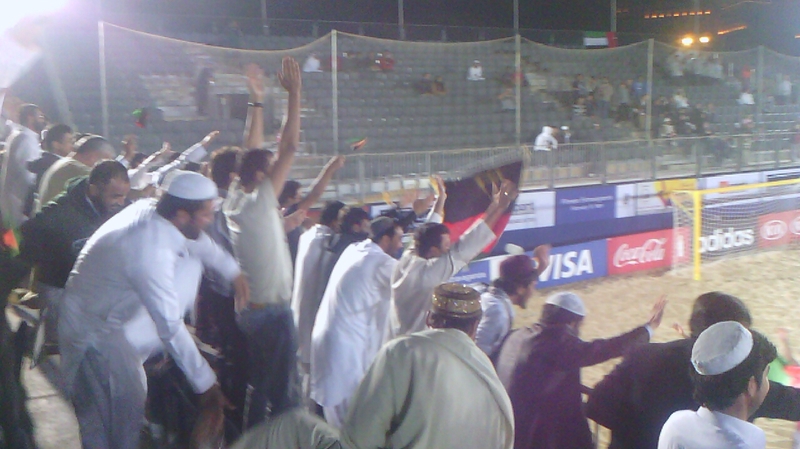 Beach football is usually garbage but being sat with 200 Afghans as they trashed Qatar 7-3 with their goalkeeper making a string of fantastic saves and then scoring on the counterattack was brilliant. The Afghans who do the poorest jobs were great fun. They were smiling, had drums and danced and cheered. Plus if you know anything about Afghanistan, you’ll know how diverse they are ethnically and that really showed in the crowd. The previous game brought out the local Thais and Japanese as their nations dueled to a 4-1 Japanese win. The Japanese are good at this, twice winners in the past but this time their hopes seems to rest on the 6-4 African guy who played at the back! The Qataris themselves were embarrassing in their lack of support for their team. I went back with friends here for the finals. The UAE controversially beat Australia (who scored an equaliser a second after the final whistle). The UAE spent a significant amount of their time rolling around on the sand too. 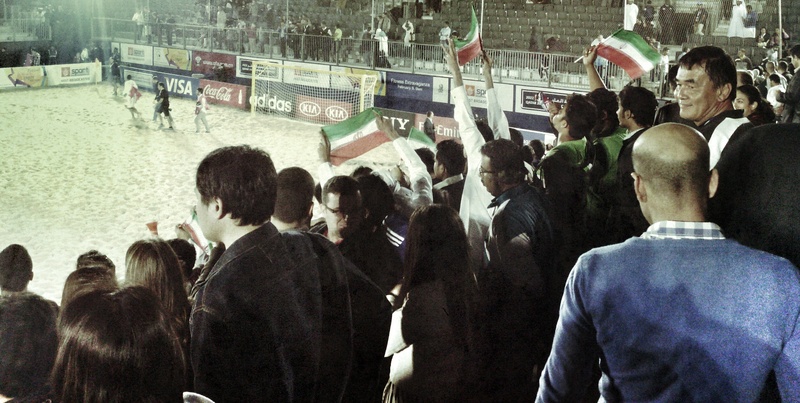 The final brought together Japan and Iran and its fairly raucous fans. Iran used their size advantage to bully the Japanese but simply couldn’t get past the best player in the tournament, a lanky, black ‘Japanese’ guy called Ozu. Japan led throughout until the last few minutes when Iran scored 3 quick goals to equal it up. It went to penalties and Iran kept their nerve. The best team beat the best player who tired after leading the whole team and never being subbed. The top 3 team went through to the World Cup beach football tournament in……Taihiti. I am in the wrong business. Great nights of football and cultural experiences.